In this tutorial step by step we will learn to save and Retrieve JSON data in Local folder of Windows Store App. Follow following steps to save and retrieve JSON data in local storage. 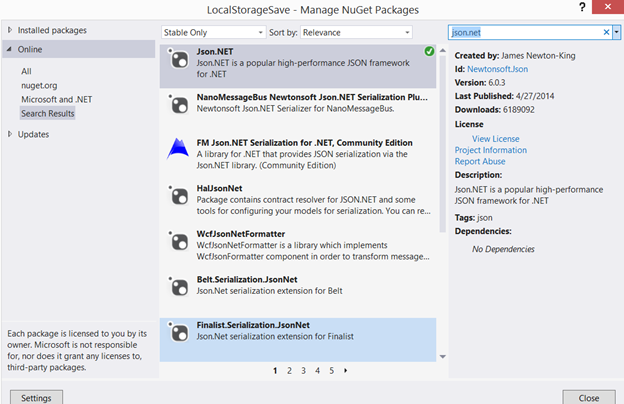 Right click on project and add Nuget package and add package of Json.NET. Let us assume that we need to store Student information in local storage. For that I have created a Student class. Before saving data we need to serialize the class into JSON. We will serliaze that using JSON.net library. After serializing object into JSON we will save data in local folder of windows store application. S is object of class Student. We are reading student properties from various textboxes. In these four steps data can be saved in local folder of Windows Store Application. To read JSON data back we need to first read data from local storage and then deserliaze that to object from JSON. Reading data is very simple. By following above steps you can save and retrieve data in local folder of Windows Store application. I hope you find this article useful. Mobile apps are able to handle .json files. Using the same code like above, but with a .json file. I am new to windows phone programming.. I want to build an app for the students for that I want to store and retrieve student data from a json file..
can u explain me where did you write step 3 in windows phone application..
Where did you write ..?? Make a separate class..and which namespace are using for this code..